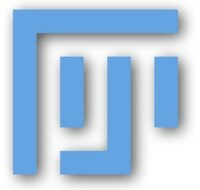 TGs decade-long experience in providing analysis solutions to the biosciences market has tought that vaunted "only one click" products work - but only on the textbook quality image on which they are presented. Tissue detection was the first step in the solution. In a second step a composite image of both brown and blue channels was created. 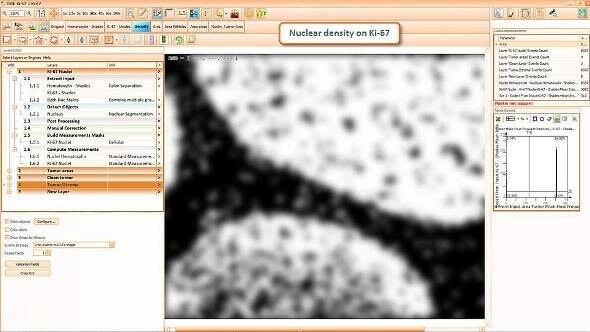 Then, a density map of the nuclei was created to determine areas with denser and larger nuclei. 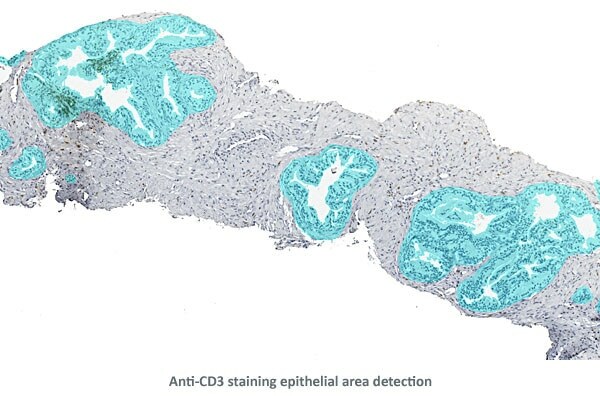 Based on the density map the epithelial areas were detected and cleaned. 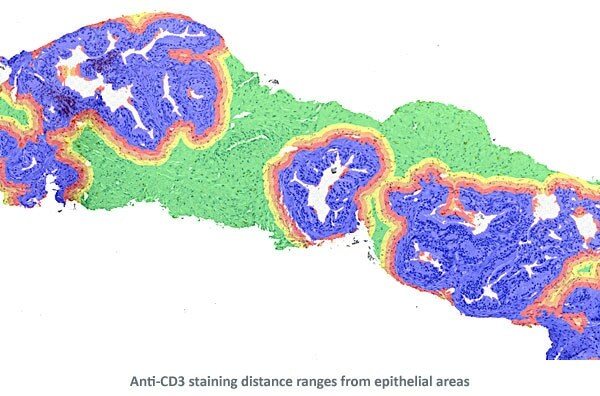 Finally, distance ranges were projected from the perimeters of the epithelial areas for distance measurements of Anti-CD3 positive cells. 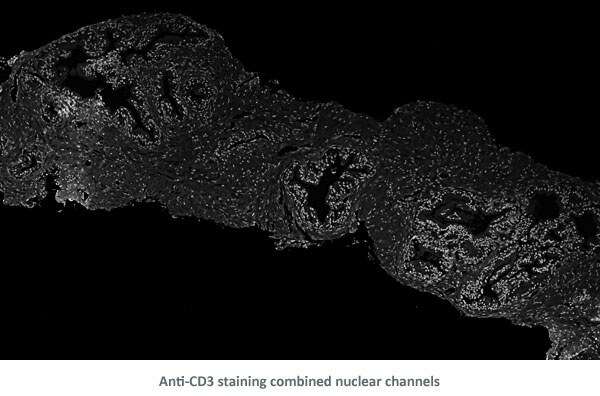 The three detailed view images below show the detection of nuclei and Anti-CD3 staining. 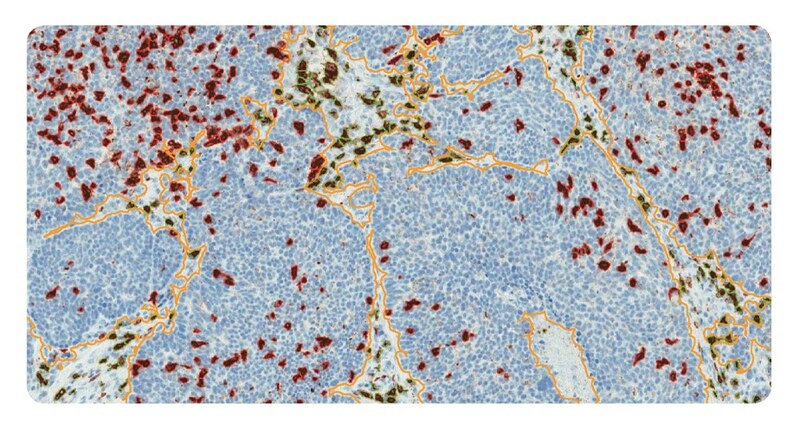 90 antigens + detected morphological structures + identified cell types = ? 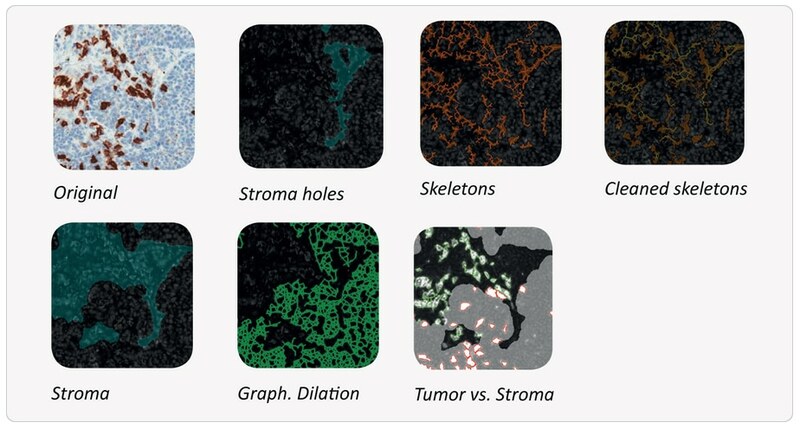 Multi -epitope ligand cartography (MELC) is a technology using samples subjected to cycles of fluorescent staining, imaging and photobleaching. Each cycle can use an antibody for a different protein. The result is a set of images of the distributions of many proteins for the same sample. 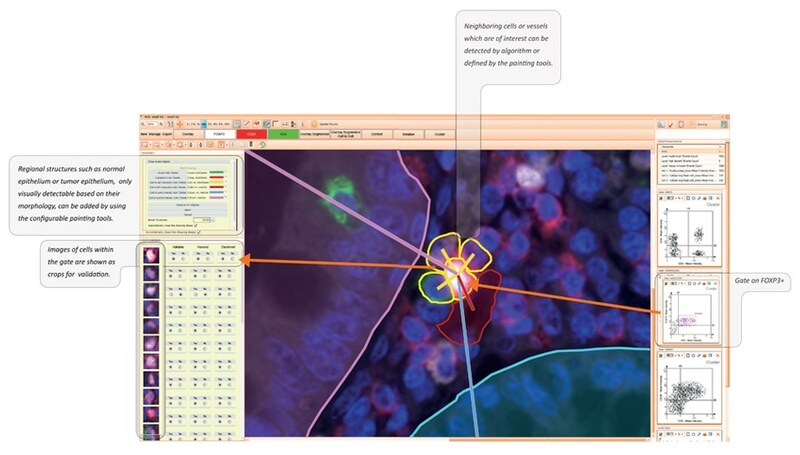 StrataQuest is ideal to fully address the immense potential of such samples with automated context analysis. A MELC sample of skin from a melanoma patient was analyzed. The aim was to quantify the expression of all 90 proteins in close proximity to Melan-A positive areas. Some operation result images are shown below. 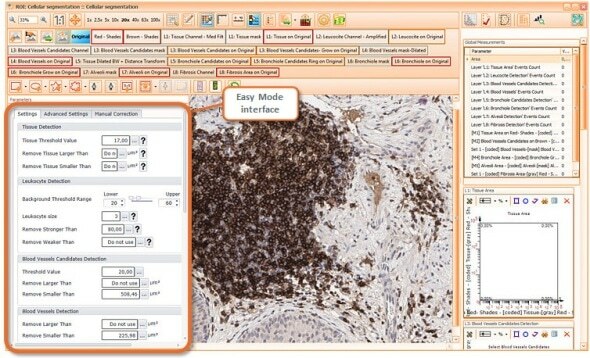 The possibilities of the combination of cyclic stain-bleach methods and StrataQuest context-based analysis are almost endless. Normal melanocytes, Melanoma cells, Blood vessels, Inflammation sites, Sweat glands, Hair follicles, Basal membrane, Langerhans cells, Intraepithelial T-cells, Regulatory T-cells? One of the main strenghts of StrataQuest is the capability to segment morphological structures based on a morphological stain alone (i.e. without a specific staining of the structure to be detected). 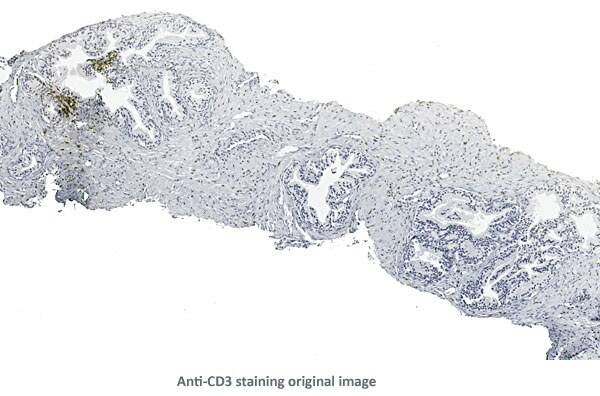 In the case shown this was used to detect thin areas of stroma between tumor areas in a tumor sample stained immunohistochemically for CD8+ T-cellls with a Hematoxylin counterstain. The counterstain was used for stroma detection. 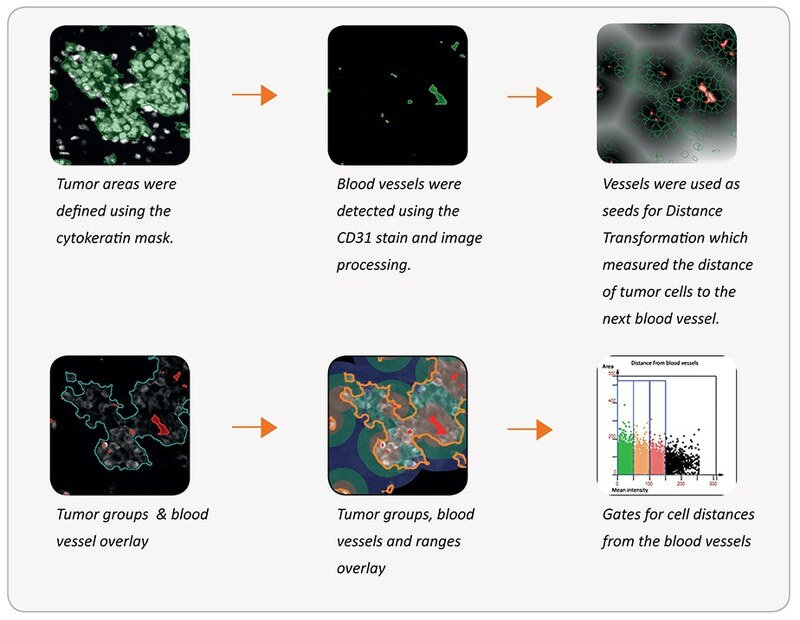 The images show major steps of the automated analysis process. 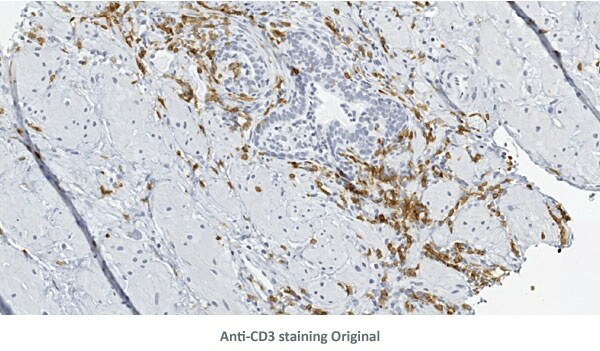 Stroma areas were detected using the hemalaune counter stain only and it was shown that 17,3% of the sample are stroma (orange outline). 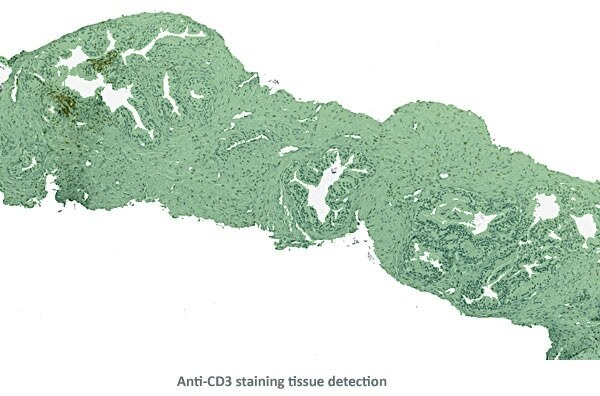 22% of CD8+ T-cells are located in stroma areas (outlined in green). 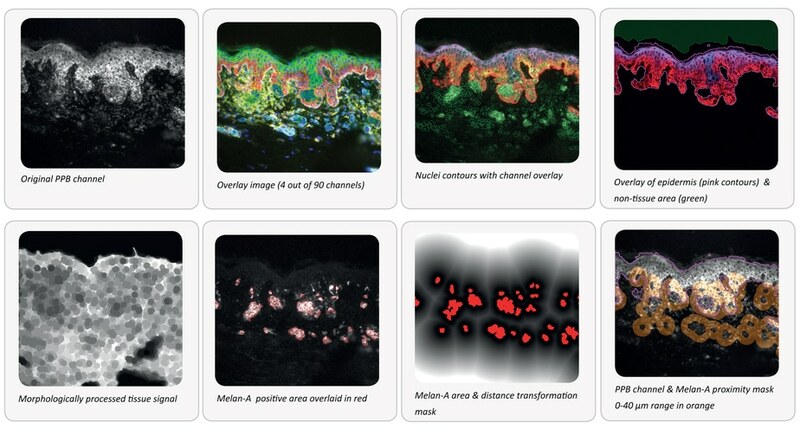 The same morphological differentiation capabilities can also be used on immunofluorescent samples. Tumor areas are detected using anti-cytokeratin+ cells. 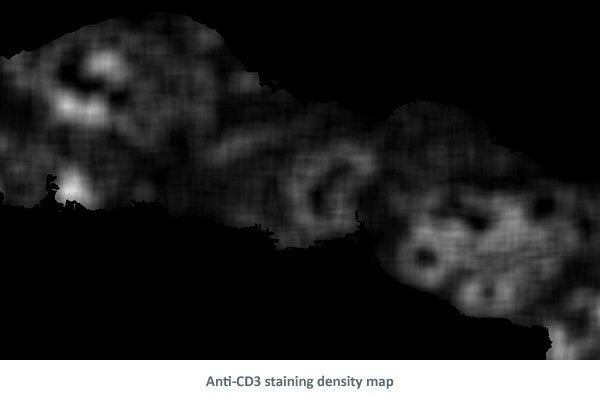 Blood vessels are detected using anti-CD31 + structures. The distance of tumor cells from blood vessels within the tumor areas can then be measured. Some basic steps of the analysis are shown below.